RVing Louisiana has always been a great way to see all the rich history - from plantations, the Mississippi River, Mardi Gras in New Orleans to great oil and petroleum exploration. We all know the basic history of various places or parts of Louisiana. Many of us have probably been to New Orleans at the Mardi Gras or perhaps lucky enough to attend a Football Super Bowl Game in the Super Dome. The mighty Mississippi River, that mentally at least divides the east and west coasts flows out into the Gulf from here. However, this is about some neat places to see while traveling in your RV. It seems many of us either go across the state at the southern end (I-10) or the northern end (I-20). We stopped in West Monroe (I-20 - the northern end! 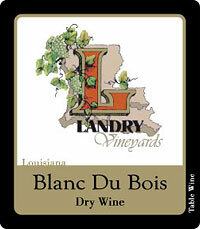 ), because Harvest Hosts has a Vineyard listed here - Landry's Vineyard - Not sure when we'll leave!! Seriously, read all about the great opportunity to visit various Vineyards in the US, or just while RV'ing Louisiana, on our RV Boondocking Page. There's a great explanation about Harvest Hosts right there. 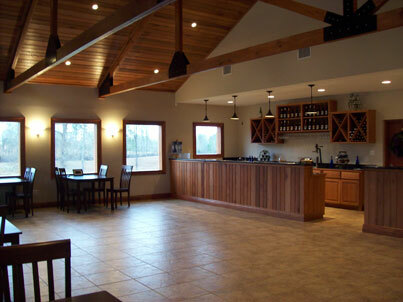 We called Landry Vineyard to arrange a visit and overnight RV stay. We arrived early in the afternoon and met Libby (Mrs.) Landry, who provided a fabulous tour of their wine tasting room - an incredibly beautiful structure with the wooden beams and ceiling constructed with wood right from their property! Beautiful room and setting - plus, Karen really loved the wines!! 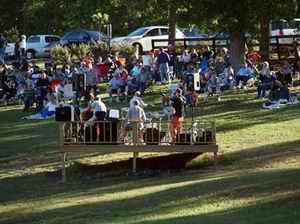 They also host parties, weddings and concerts right on the grounds. All during the spring and summer there is usually some kind of an event hosted by the Landry's at least once a month. Great entertainment if you are in the area! Obviously it helps them, but it also helps the community! We weren't kidding - that really is a gorgeous room!! The following morning we met Jeff (Mr.) Landry. He gave us a great tour of the "behind the scenes" area of the operation. After an extensive tour, Karen and I liked both Jeff, Libby and their children ( 2 youngest are still home) so much, that we offered to help "prune" their vines on Saturday and have gone out every Saturday for about 2 months - like I said, we may never leave!! Plus, their wine is delicious!!!! RVing Louisiana sure is a great idea, huh?!? Aside from loving Landry Wines, Karen also likes Tea. One morning we heard an ad on the radio for a local Tea store - so we got on our scooter and found it on a really neat "old town" Main Street (actually Trenton St). Most of the stores on both sides of the street were antique stores in a restored old downtown Main Street atmosphere. Remember, we are in Louisiana - home of the Mardi Gras and West Monroe has the Northern Version of it right here. It was just so neat to wander in and out of all the various stores (on our way to the tea place!). We could really feel the Mardi Gras atmosphere building within the stores and community - how cool is that?!? 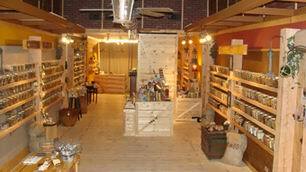 Finally, we got into the nicest tea and spice store ever - called "The Spice & Tea Exchange of West Monroe". Turns out it is a franchise (hence the West Monroe in the name). We had a great time sniffing and checking out all the great spices and teas. The owner, Karen Laban and her assistant, were incredibly nice and helpful and just made the entire buying experience so great! Isn't that a nice, bright and airy store!? Great Look and Feel! If you have a chance and are RVing Louisiana, especially up in the northern area, be sure to exit at Exit 112 of I-20! Stay at the Pavilion RV Park - just south of the exit off I-20. The owners, Kenny and Laurie, are the greatest and believe in that great southern hospitality! We stopped in after staying at Landry's Vineyard and may not leave!! Between Kenny and Laurie and their great clean RV Park, the weather is beautiful, the people nice, accommodations are great - why would you leave!?!? These are the type of people that make RV Louisiana so special! Finding a good health food store can be quite challenging while traveling in an RV. Finding a GREAT one is even more difficult! Well, guess what, while RVing Louisiana we happened across one in Monroe, LA that is exceptionally great! It is large, clean, airy, well stocked, good prices and very helpful staff. We had done the famous "Google Search" for a Health Food Store and the first 4 or 5 were no longer in business. Rather than giving up, we pressed on, and found Fiesta Nutritional Center , 1211 North 18th Street, Monroe, LA 71201 has been in existence for over 37 years!! Yes, they are serious about their business and it shows. Their website even has a great "Library" source of articles. Plus, they carry The Greek Gods Yogurt with Honey!!! The BEST YOGURT you'll ever taste!! Seriously! Not east to find; but - wow, incredibly delicious! Golson's Unique Gas Lamps is located right off I-20 on Cypress Street, between Exit 113 and 114. Not only do they have a great area to purchase Propane for any size RV, they have the largest selection and inventory of unique and beautiful outdoor Gas Lamps I've ever seen. Curry's Truck is located just off I-20 at Exit 118 South on 165. Incredibly large truck repair facility that can do just about anything. Since most Class A RV's are a HD Truck Frame/Chassis setup, Curry's Truck is ideal for anything to do with chassis, frames, alignments, body work, etc! We needed to have the front wheel bearings repacked. Made an early morning appointment, got in right away and out several hours later - all at a fair price. The service techs and staff were all very friendly and knew just what they are doing - highly recommend Curry's Truck. I know these are just people and places on our RVing Louisiana page. However, we both felt very welcomed and really like this part of Louisiana. I can't help but think that as you get closer to New Orleans, it won't be quite so warm and fuzzy a feel!